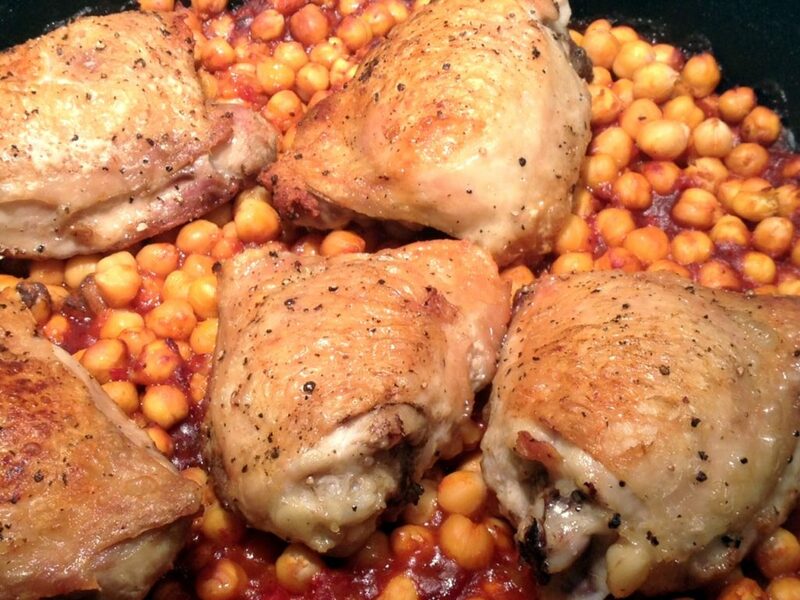 This Harissa Chicken recipe is easy to make and healthy. 8 skin-on bone-in chicken thighs (bone-in chicken completely disgusts me, so I ask the butcher to de-bone them. Maybe I should get better at doing this myself). Heat oven to 425 degrees, F. On the stove, heat oil in a large oven-proof skillet (I use cast iron) over medium-high heat. Season chicken with salt and pepper, and cook until browned (5 minutes per side). Cook in 2 batches so they’re not crowded in the pan, which leaves them not browned, but braised. Set chicken aside on a plate. Pour off all but 1T drippings from pan and add the onion and garlic. Stir often and cook until softened, making sure that it doesn’t brown. (I start with the onion, because if the garlic gets overcooked, it turns bitter). Add tomato paste and cook until it starts to darken, about 1 minute. Add broth, chickpeas and harissa and bring to a simmer. 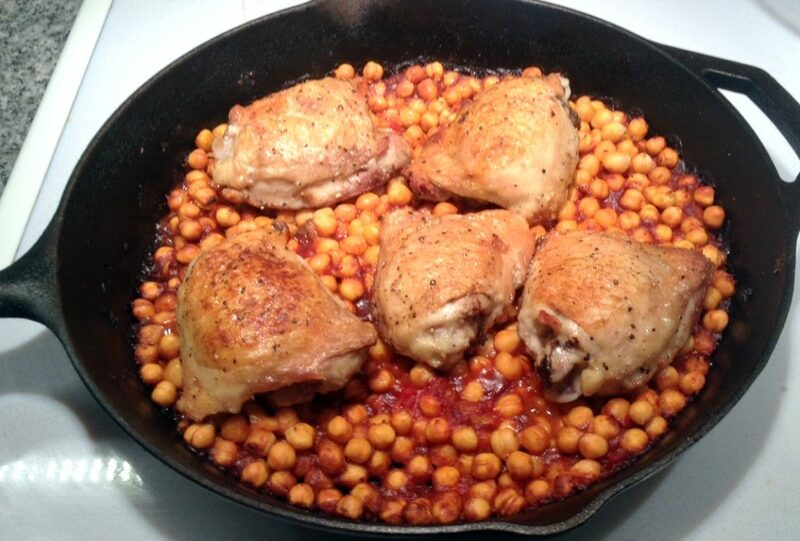 Take the chicken and nestle it within the chickpeas, skin side up, and put the pan in the oven. Cook for 20-25 minutes until chicken is cooked through. Serve with parsley sprinkled on the chicken and with lemon wedges (optional). I would make this with boneless thighs next time. Chicken bones are disgusting to me. *Harissa is a northern African paste made primarily from hot chili peppers, roasted red peppers and various spices. It’s not necessarily super-hot. In fact, the brand that was available to me was rather mellow. Your high-end local grocery store should have it, or you can order it online, including from Amazon.com.